Recently, there’s been a shake-up in medicine, as medical professionals begin to get serious about cleaning up conflicts of interest in research, journal articles, clinical guidelines and continuing education, and are adopting new disclosure policies. As is becoming increasingly recognized, financial and ideological interests are polluting the scientific integrity of medicine and using science for financial or political purposes. Even the scientific literature has become tainted, as studies are funded that have poor methodologies, designed to produce results that can be used to further interests. Thus far, however, while eyes are most intensely turned towards industry conflicts, nonprofits and foundations have generally continued to fly under the radar. 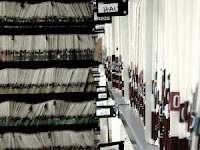 Peer-reviewed medical journals typically follow the same disclosure regulations for research receiving public funds issued by the Office of Research Integrity at the U.S. Department of Health and Services, which have one major loophole. Funding that comes through nonprofit foundations, institutes and professional or patient advocacy organizations, and salaries and grant funding that comes through institutions and university programs, don’t have to be disclosed, enabling well-funded and savvy nonprofit or “advocacy” groups to silently influence research, expert committees writing clinical guidelines, and public policies. It's not often that Yale scientists take positions on issues of the day, much less actively speak out in favor of specific legislation. But Brownell and the Rudd Center have become major players in the arena of obesity research and public policy… Key to the Rudd Center's prominence is the concept of "strategic science," explains Rebecca Puhl, its director of research. Rudd is the only institution of its kind that takes such an active role in using its work to shape public policy. "Our idea was to work at the intersection of science and public policy," Brownell says. "We don't do advocacy, but what we want to do is inform the debate." The overall message is urgent: More than two-thirds of American adults are currently overweight or obese, and numbers are rising all over the world. "The health and financial consequences are severe," Brownell says. "There are few conditions out there that would rival it." Having a private funding source also allows the center to direct its efforts toward research that can have the most impact on policy, Puhl adds. "We really have a unique opportunity here," Puhl says. "We can do science faster and we can do the science we think is meaningful, and that is a very rare occurrence." "We saw an important gap between public policy and science," Brownell says. "What we want to do is inform the debate.".. The law has proven an integral part of many major public health victories over the past century… many experts consider obesity to be the next frontier of public health law. Among the most important subsets of obesity law are laws requiring menu labeling, those regulating marketing of non-nutritious foods to children, and the role litigation may play in addressing nutrition and obesity issues on all fronts… The Rudd Center expects many obesity-related issues will be resolved through regulation, legislation and litigation, and we are pleased to remain on the cutting edge of these legal initiatives and developments. Rudd’s website supports the information presented by Klein in Business New Haven. “At the Rudd Center, we conduct our own research, track others’, and alert policy makers when the findings can be used to write policy,” its website states. One example of Rudd research is an article published in the American Journal of Public Health and distributed through its website. It was authored by professors Lenny R. Vartanian, Ph.D., Marlene B. Schwartz, Ph.D., and Kelly D. Brownell, Ph.D.
L. R. Vartanian co-originated the project, retrieved and coded the relevant articles, conducted the analyses, and cowrote the article. M. B. Schwartz assisted in the coding and analyses and cowrote the article. K. D. Brownell co-originated the project and cowrote the article. This work was supported in part by the Rudd Foundation. We thank all of the authors who responded to our request for unpublished and in press research. Note. Personnel from the Rudd Foundation were not involved in this work in any way. All of the authors of the present article had full access to the data. The editors of this peer-reviewed journal permitted this misleading disclosure, leaving healthcare professionals unaware of interests that might have helped to alert them to examine this paper with special care — the very purpose of disclosures. No mention was made of the Rudd Center for Food Policy and Obesity at Yale University. Nor was it revealed that the authors were the co-founder and director [Brownell], and deputy director [Schwartz] of the Rudd Center for Food Policy and Obesity. As professor Brownell told the New York Times in an April article on the ethics of scientists and academics accepting money from industry, associations can affect a person’s objectivity and it’s easy to offer subtle statements that would favor one’s associations. “You do it for two reasons,” he was quoted as saying. “You’ve got a money stream coming in, and you get to like the people who work for the companies. You feel like you’re on a team.” He says he no longer accepts industry funding. Independence in itself does not make the advice right, and, conversely, partisan advice is not necessarily wrong. Similarly, an adviser's bias will not necessarily colour all of their judgments adversely… What independence does is to improve clarity. For me, independence has meant saying what I mean and often being seen as rude and uncaring; holding no favours; deciding on each issue on the basis of the evidence rather than blindly following the majority; risking being seen as inconsistent (a loose cannon); not necessarily being able to support friends and colleagues; giving advice that runs counter to my personal interest; and criticising employers or senior members of the establishment. Perhaps predictably, the positions I have taken have often caused me difficulties. I have lost friends, been ostracised by the establishment, and had my career advancement undermined. But the freedoms and intellectual satisfaction gained by being allowed to be an independent thinker giving unfettered advice have far outweighed these burdens. Moreover, for each of the friends I have lost, I believe I have gained professional colleagues who value and trust my judgments. My career progression is not necessarily what one would advise for someone starting out in medicine, but for those who put independence of thought high in their hierarchy of values, the stance is worthwhile and rewarding. Professor Collier, a long-time whistle blower against discriminatory and unsupportable clinical care guidelines and public policies, spoke at the DURG meeting in London on February 7th earlier this year. He discussed “What is evidence-based medicine.” As he noted, studies and meta-analyses can be easily skewed to favor a sponsor. His key point bears repeating, as everyone — healthcare professionals, public policy makers and consumers — is increasingly inundated with studies being used to support conclusions and interventions that go beyond the best evidence. What is evidence-based medicine? The practice of medicine based on the integration of well-controlled (scientifically valid) clinical trials, along with clinical expertise and patient values, he said. Best evidence doesn’t mean “best in terms of availability,” he said, but “best in terms of scientific validity.” That evidence can only come from well-controlled clinical trials and meta-analyses using primary data. One cannot just tally the studies published on one side or another, but must continually assess the data, as well as the body of evidence. “Clinicians should be honest, recognize their limitations and wherever possible ensure that their decisions have a rational basis,” he concluded. The very real problem we face is that so much published clinical trial data isn’t scientifically valid, has flawed designs, partisan bias and distorts the evidence, he said. It’s unrealistic to believe we can create perfect, universal evidence-based medicine. But in the interests of patient welfare, he said, biases should be made clear in the publication of trials and taken into account by clinicians before applying the advice in their individual clinical practices. Do fruits and vegetables protect from colorectal cancer? Last year, we heard that fruits and vegetables were not linked to colon cancer and that risks were similar between men and women. A Harvard study had been unable to find any tenable correlations among data of 756,217 men and women. This month, we heard that fruits and vegetables may protect men from colorectal cancer, but not women. What we have here is another case of epidemiological whiplash. This study, published in the current issue of the American Journal of Clinical Nutrition was led by Dr. Abraham M.Y. Nomura, M.D., Ph.D., from the Epidemiology Program at the University of Hawaii in Honolulu. These researchers looked for correlations between fruit, vegetable and grain intakes and cases of colorectal cancer among the nearly 200,000 Multi-ethnic Cohort Study of Diet and Cancer participants. Our first clue that this study was done in a computer and unable to provide us with any meaningful clinical information was the large Trojan number of nearly 200,000 participants. The second was the fact that the authors were looking for associations, which are irrelevant to us until actual clinical studies test any hypotheses generated. As we know, correlations, no matter how significant they might seem, don’t necessarily mean anything. When culling through large databanks, the chances of finding unusual correlations become highly probable. Based on the principles of probability and statistics, they’re best thought of as coincidences. Even remarkable and huge ones aren’t at all uncommon or extraordinary. The Multi-ethnic Cohort Study databank used in this study had been created between 1993 and 1996, when more than 215,000 men and women of mostly African-American, Japanese, Latino, Native Hawaiian and Caucasian ethnicity living in Hawaii and Los Angeles had completed a 26-page mail-in questionnaire about their diet history, demographics, medical history and lifestyles. For this analysis, the researchers used data from 191,011 of the cohort, restricting it to those five major ethnicities and excluding data on another 8,265 participants because of implausible dietary information. Over the next seven years, through 2001, 2,100 cases of colon and rectal cancers were identified via the Hawaii Tumor Registry, the Cancer Surveillance Program for Los Angeles County, and the California State Registry, along with the death certificates on file in Hawaii and California. According to the raw demographic data, there were no statistical differences in BMIs, current cigarette smoking, red meat intake, vigorous physical activity per week, or aspirin use among either men or women and cases of colorectal cancer. The most significant differences between those who were later diagnosed with cancer and those who weren’t were age and family history of colorectal cancer. Compared to the remaining cohort, the cancer patients had been about 5 years older at the start of the study and had been more than half again as likely to have had a family member with colorectal cancer. The dietary database for the Multi-ethnic Cohort Study had been created from self-administered food frequency questionnaires which had asked each participant how often they consumed foods in 8-9 categories and to select one of three portion sizes for each food item. The authors used food composition tables and a large recipe database from the Cancer Research Center of Hawaii to calculate intakes for specific food groups. To calibrate their estimates of weights and calorie counts, the authors had randomly selected 1,606 study participants to complete three 24-hour dietary recalls administered over the phone during a 3-month period and additional food frequency questionnaires. For this analysis, the authors divided estimated food intakes for fruits, vegetables and grains into quintiles, with Q1 the lowest fifth of consumption and Q5 the highest. The authors then let Cox proportional hazards computer models calculate the relative risks between the different quintiles of each food group and the cases of colon and rectal cancers. The relative risks were adjusted in their multivariate model for age, ethnicity, family history, history of colorectal polyp, cigarette smoking, BMI, physical activity, aspirin use, vitamin use, hormone replacement therapy, caloric intake, alcohol, red meat, folate, vitamin D and calcium intakes. For men, they reported a 26% lower relative risk of colon and rectal cancers between the highest quintile and lowest quintile for vegetables and fruits combined, and a 20% lower relative risk associated with fruit intake. A 15% lower relative risk associated with vegetables alone was of borderline statistical significance. Looking at rectal and colon cancers separately, none of the correlations with rectal cancer were significant. In other words, these results were null. None of the relative risks were even tenable for computer-derived correlations. Relative risks under at least 200% - 300% are considered no better than what could come up a random error or chance, and are most likely explained by co-factors. But, did you catch what wasn’t reported? Here’s the trick: Reporting just the relative risks between the top and bottom quintiles of fruit and vegetable consumptions leaves out all of the other consumption levels in between. The reported inverse relationship to colorectal cancer between eating the highest amounts of fruits and vegetables and lowest was not linear. The correlations among the various quintiles for each type of produce looked like a see-saw, up and down at each amount consumed. In other words, there was no dose-response. Relative risks for cancer didn’t steadily go down as the amounts of fruits and/or vegetables went up. So, for example, as the consumption of vegetables went up with each quintile among the men, the relative risks for colorectal cancer went up to 7% higher, then down to a 14% lower relative risk, then up to 9% lower risk, and then down to a 15% lower risk. The relative risks all hugged either side of 1 (null). Looking just at colon cancer among the men, fruits and grains didn’t correlate at all, as the authors reported. And the correlations with vegetable intakes did the roller coaster starting at no intake: going up to 3% higher relative risk, to 23% lower risk, up to 14% lower risk and down to 20% lower risk. In other words, men consuming the highest amounts of vegetables could “lower” their risks for colon cancer by cutting their vegetable consumption in half! That’s not quite the results being reported in the news. To help bring perspective to any lingering concerns that these correlations are clinically meaningful, look at the actual amounts of vegetables consumed at the lowest and highest quintiles. Among men, the lowest veggie consumption group ate about 2.5 ounces/1,000 kcal and those in the highest group ate about 8.3 ounces/1,000 kcal. The range among women was 3 ounces to 10 ounces/1,000 kcal. The range of fruit intake among this cohort was wider, with a 9.8-fold difference: men’s intake varied from 1 to 10.4 ounces and women from 1.6 to 13.4 ounces per day. Yet, the authors still found no tenable correlations with colorectal cancers. Some want to believe that there are special cancer-fighting types of fruits or vegetables. To investigate this possibility, the authors next looked at correlations between colorectal cancer and types of fruits and vegetables at each quintile of consumption. They were unable to find any statistical differences in risks associated with any particular type of veggie or fruit among the men or women at any level of intake. Yet, even pulling out one of those correlations with grains could be made to sound really scary to consumers who don’t understand tenable correlations. For example, there was a 45% higher relative risk associated with rectal cancer among women eating 20% more grains than none at all (of course, then the relative risks went down, then up, then down again). The bottom line, this National Cancer Institute-funded study found no tenable correlation between fruits, vegetables or grains eaten by these Americans and colorectal cancer. As the study authors noted, null findings of an association concur with the bulk of the epidemiological research — including the Health Professionals’ Follow-up Study, the Nurses’ Health Study, the Women’s Study, and the Japan Health Center study — all of which found no association between vegetable or fruit consumption with colorectal cancer in men and women. Past cohort studies also haven’t supported an inverse relationship between fruit intake and colorectal cancer, they noted. “There was no association between fruit intake and colorectal cancer among men in six studies… Six other cohort studies also reported no relationship between fruit and colorectal cancer among men…Six other cohort studies also reported no relation between fruit and colorectal cancer among women.” The only contrary studies, said the authors, were two other epidemiological studies (the Swedish Mammography Screening Cohort Study and the Cancer Prevention Study II). Both of those, however, had reported untenable relative risks also comparing the highest quintile of fruit intake with the lowest. Enjoying a varied diet continues to be our best defense to help prevent nutritional deficiencies and make eating loads more fun. But, popular claims in media — even in medical continuing education materials offered by Medscape — of special benefits of produce to protect against colorectal cancers continue to be unsupported in the medical literature. Only you can protect yourself from epidemiological whiplash. ** A medium tomato or zucchini weighs about 5 ounces, a carrot about 3 ounces, and medium sweet potato or potato weighs around 8 ounces. Brief policy update: Wednesday, the U.S. House of Representatives passed H.R.1381, which makes public health and preventive health an increased federal priority. The resolution was sponsored by Rep. Lucille Roybal-Allard, with 114 co-sponsors (107 Democrats, 7 Republicans). Trust for America’s Health, which lobbied Congress, as well as developed the funding priorities precisely outlined in this legislation, issued a press release applauding the passage of the Resolution. "Promoting healthy lifestyles will reduce the impact of devastating chronic diseases like Type 2 diabetes and heart disease, and it will save lives," said Rep. Michael Castle. "Passage of this resolution signals strong support for prioritizing prevention to improve individuals' health and lower U.S. health care costs." (6) pledges to help significantly improve the health of all people in the United States by supporting increased investment in Federal public health programs. The primary causes of premature death in the United States and other developed countries are, of course, heart disease, cancer and alzheimer’s. These chronic diseases of aging, politicians appear to believe, are people’s own faults through improper lifestyle choices and are preventable. But only politicians and government bureaucrats could ignore the good news evident in the government’s own statistics and turn it into a national health crisis. The nation’s health care system can’t be overhauled without first addressing preventable health problems, particularly obesity, former Arkansas Gov. Mike Huckabee said Tuesday. The former presidential candidate told a crowd of health insurers and care providers that politicians tend not to focus on preventable chronic health problems… He compared dealing with healthier living issues to anti-littering, seat belt and anti-smoking campaigns that took decades to take hold… according to a Trust for America’s Health study released last month. South Carolina ranked seventh for childhood obesity at nearly 19 percent. Forkner expects new preventive care programs the state has begun using will help cut costs. Ten years ago, a little cookbook with kid-friendly recipes for families to make together was published. This was a very special little cookbook. It was filled with tender letters from children who’d gotten to go to Hole in the Wall Gang Camp. It was impossible to read without getting swept up in the spirit of hope, love and courage of these young campers... and of the extraordinary vision of the man behind Hole in the Wall Gang Camps. All of the proceeds from this cookbook went to the Hole in the Wall Gang Camps, a year-round camping program that provides children with cancer and other serious illnesses the camping experience of their life... with a focus on life, fun and being a kid. All free of charge. The cookbook was Hole in the Wall Gang: Kid-Friendly Recipes for Families to Make Together by Paul Newman and A.E. Hotchner. The recipes were from Paul Newman’s family, friends and winners of Newman’s cooking contest. Mr. Newman opened by lamenting how the kitchen has been under attack and how many children never know the joy of cooking and a love of food. While bringing children into the kitchen was one goal of this book, the larger one, of course, was to support the charity he founded more than twenty years ago. While not a scientist or doctor, Mr. Newman loved these children. He envisioned a place where children could come, strictly for fun and to enjoy a carefree camp experience that could heal their spirits, encourage, inspire and restore hope and confidence. But it would also have 24/7 medical supervision, with all of the modern medical equipment and top medical professionals that any medical emergency might need. The first Hole in the Wall Camp opened in 1988 in the Connecticut woods and today, there are eleven camp programs around the world. Over 135,000 children have had the chance to attend a camp and be a kid again. The program also provides year-round support to families and caregivers, offering respite, counseling, support, training and other assistance. Paul Newman was a silver-screen legend - but he was also the guy who gave me some of my happiest childhood memories. As a young lad in Mattapan in the ’80s, I was one of those sickly kids in and out of the hospital, diagnosed with what was then considered a terminal disease, with a prognosis from doctors that I wouldn’t live past my 20s. I’m grown now, and my doctors were wrong - I breezed through my 20s. But I learned to overcome some obstacles by toughing it out like “Butch” in Newman’s camp, which still sits in the boonies of Connecticut, and from what I understand has grown into something even more extraordinary. So, on behalf of all the sickly kids that just wanted to live life and be kids - thanks, Mr. Newman. You will be missed. 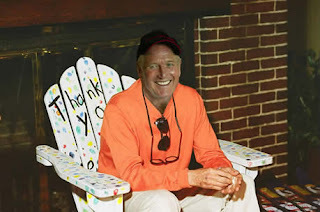 Hole in the Wall Camps, the charity that Paul Newman founded, posted a special tribute to him today on its website, where you can also learn all about these camps and how you can help support this living legacy. And if you’re lucky and have a copy of the cookbook, or even if you don’t, gather the kids into the kitchen and bake cookies in memory of a pretty cool man. Place oven rack in center of the oven. Preheat oven to 350º oven. Line 2 cookies sheets with parchment paper. Stir together the flour, baking soda, baking powder and salt. Set aside. Stir in the chocolate chips and toffee peanuts. Drop the dough by heaping teaspoons onto the prepared cookie sheets, about 2 inches apart. With a wet spoon, gently flatten each mound of dough until it’s about ½-inch thick. Bake, one pan at a time, for 7-8 minutes, until the edges are just golden brown. Remove from the oven and cool. Remove from the pan. Makes about 3 dozen small cookies. Remember the BMI report card debate? When Arkansas enacted Act 1220 in 2003, it was done with great fanfare and national attention. So began the largest and most comprehensive statewide school-based childhood obesity initiative ever enacted in the country. Act 1220 was to provide the proof needed that the war on childhood obesity could be won. The fourth annual report evaluating the effectiveness of the Arkansas Act 1220 was quietly released recently. Never in the history of our country have there been such vast amounts of public health and education funds and resources — and more policies addressing every facet of communities, homes and school environments — devoted towards addressing childhood obesity. 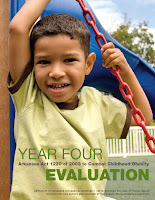 The Arkansas Act is held up as the model for childhood obesity programs affecting every child in the country. So, the report evaluating its effectiveness, and potential detrimental effects on families or young people, should have been front page news and reached every parent and taxpayer in the country. But if you heard nothing about it, you weren’t alone. A scattering of local news stories reported that the law was a “Big Success” in creating healthier school environments, noting that junk foods and sodas were being prohibited in growing numbers of schools, and more parents and kids understood BMI and the health risks of obesity and were making changes to eat healthier and exercise more. A lead author of the evaluation report, Jim Raczynski, Ph.D., dean at the Fay W. Boozman College of Public Health, told media that the changes that have taken place in Arkansas schools are probably more extensive than anywhere else in the country and that Arkansas is leading the national trend, with the entire country looking to Arkansas as a model for their own public policies. Reading closely, of course, those claims of success are based on processes, not actual clinical outcomes improving children’s health or even addressing the Act’s key goal: reducing rates of childhood obesity. Act 1220 was signed into Arkansas law by former Governor Mike Huckabee in April 2003, which launched this far-reaching program to combat childhood obesity. Its main provisions included annual BMI screenings of all public school students with reports sent to their parents; the implementation of policies restricting access to vending machine junk food and sugary drinks in public schools; the creation of community partnerships and a Child Health Advisory Committee to develop nutrition and physical activity standards and wellness programs in schools and communities; and intensive curriculums on the health risks of obesity and to promote weight control and healthy lifestyle behaviors in youth and their families. The Robert Wood Johnson Foundation supports the collection of BMI and evaluation data and its reporting. The latest evaluation of Act 1220 actually comes in the form of two reports. One is the technical report on the BMI assessments and on the program’s success in achieving its main goal: reducing rates of obesity among young people in Arkansas. The other, is the complete, four-year evaluation of Act 1220, specifically examining how the program has affected the health and welfare of children. Here’s a look at both. This publication reported the detailed BMI assessment data and weight classifications among students from each of the counties and school districts for the 2006–2007 school year. It was authored by the Arkansas Center for Health Improvement (ACHI), a policy center supported by the Arkansas Department of Health and Robert Wood Johnson Foundation. ACHI’s function has been to help implement Act 1220 and evaluate its effectiveness. The primary finding of this Assessment report was that since 2003, the Arkansas Act 1220 has had no effect on children and adolescent weight classifications. There has been no reduction in ‘childhood obesity’. More specifically, there’s been no change in the rates of young people whose BMIs fall in the ‘overweight’ (≥95th percentile) or ‘at-risk-for-overweight’ (≥85th percentile) categories on BMI growth curves. Just as in 2003 when this sizeable program began, about 20% of Arkansas young people were classified as ‘overweight’, 17% as ‘at risk’, 60% as ‘healthy weight’, and 1.8% as ‘underweight’ (≤5th percentile on growth curves). 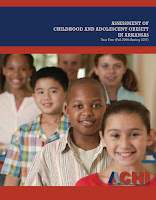 The report’s conclusions state that the findings “show that together we have continued to halt the progression of childhood obesity statewide.” Digging deeper, however, reveals that the same indications of possible harm and disparities suggested in the third evaluation, were even more prominent in this report. Yet, unlike the third report, this report’s text didn’t mention them at all — they’re buried in the data tables at the back. It appears that the Arkansas program may have most “failed” children at both ends of the socio-economic spectrum, but in different ways. The counties and school districts with the lowest reported rates of students classified as ‘overweight’ and ‘at-risk-of-overweight’, had the highest rates of ‘underweight’ students. This correlation is a worrisome indication that the intense focus on weight and healthy lifestyles could be leading some young people to adopt unhealthy efforts to control their weight to the extreme. Rates of underweight young people in Perry country, for example, were 3.14%, with a total of 33.87% of young people with BMIs at or above the 85th percentile. Rates of underweight in Conway county were 2.76%, and in Madison country 2.52%. These counties are also those with primary white populations: 95.62%, 83% and 95.94%, respectively. In Arkansas, race/ethnicity is roughly a measure of socioeconomic status, with StateHealthFacts reporting that minority children in Arkansas live with 2 ½ times the poverty of white children. Similarly, the program has had no effect in reducing higher rates of ‘overweight’ in areas of social-economic disadvantage, despite the healthful behaviors of the heavier children. Sevier county, for example, had rates of underweight of only 0.97%, but the highest rates of children with BMIs at or above the 85th percentile (45.13%). Whites make up only 79.61% of the county’s population, while 11.84% are of Pacific Island descent. Only 1.8% of young people in Lee county (with 57.24% black population) are underweight, while 47.95% of the children were reported as falling in the higher BMI categories. This publication summarized the most recent findings of researchers at the Fay W. Boozman College of Public Health at the Arkansas for Medical Sciences who’ve been conducting evaluations since the Act was implemented. 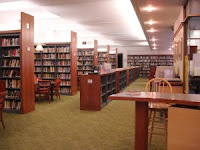 This work was also funded by the Robert Wood Johnson Foundation. A critical look at the report, however, paints a less rosy evaluation. Parents of larger children were even less enamored by receiving a BMI report on their child as compared to parents of smaller size children, with nearly 50% more of them saying that they were concerned about the confidentiality of the reports. Parents of larger children, though, were no less “aware of the health problems faced by overweight children” than other parents, nor did they differ in viewing the BMI reports as unhelpful. The unrelenting information about the health dangers of childhood obesity, however, had left them nearly three-fold as fearful for their own children. Increased weight concerns among the children. Nearly 20% of parents interviewed said that their child had expressed concerns about his/her weight that year. Among those parents, 62% said that their “child’s concerns had not been expressed before BMI assessments began at school.” Not only were students more likely to have expressed concerns about their weight after the BMI assessments began, but the younger pupils had been the most adversely affected by the program and become worried about their weight. For example, 31% of children under age 10 reported being concerned about their before the BMI assessments began, compared to 69% four years into the program. There is no evidence that this is healthful or beneficial for youngsters. Parental concerns. More than one-third of parents (38%) said that they worried their child was more concerned about his/her weight than their child should be, and 20% of parents were very worried about their child’s level of weight concern. Raising questions about the quality of the information parents are hearing about BMIs and health problems surrounding children’s weights, the evaluation report found that the percentage of parents saying they believed that childhood diabetes is a health problem for overweight children had increased to 81%, up from 66% in 2004. The authors viewed favorably the fact that nearly two-thirds of parents reported that they were trying to make their family’s diets healthier, with the greatest reasons parents gave for “changing the family to a healthier diet” were to manage weight and become healthier (29%). However, even these changes sought by the program were already waning, down by one-quarter just from 2006. Students’ perceptions. The percentage of students “not at all comfortable” with getting BMI reports had increased to 25%. But, just as polling results give only part of the story, this report one didn’t reveal the range of young people’s feedback. How many admitted they were somewhat uncomfortable? The percentage of children reporting being teased had increased, with 12% teased because of their weight (up from 6% in 2006) and 25% of children teased for other reasons (up from 19% in 2006). Are these indications that this program could be heightening body and health concerns among already body-conscious young people and increasing bullying and stigma of fat, less athletic or disabled children? Another of the key concerns of childhood obesity programs is that they can increase dangerous weight control behaviors and eating disorders. “As part of the evaluation of the impact of Act 1220, findings from the biennial Youth Risk Behavior Survey (YRBS) also are monitored,” this report explains. The YRBS is a biannual survey administered by the CDC and state and local agencies of a representative sample of U.S. high school students in each state, to evaluate six categories of health risk behaviors. It includes specific questions about weight control behaviors. But this statement should be viewed with reservation, as it gives an incomplete picture. Nationwide, the percentage of teens engaging in risky weight control behaviors, according to YRBS data, had mostly dropped nationwide. But not in Arkansas. The Act 1220 evaluation report said that in 2005, 12% of Arkansas teens admitted to having taken diet pills — this is twice that of their peers nationwide. Nine percent of Arkansas adolescents were reported as having vomited or taken laxatives (up from 5% in 2001), compared to 5% nationwide; and 16% of Arkansas teens reported having fasted in 2005, compared to 12% nationwide. In other words, higher percentages of Arkansas youth were engaging in risky behaviors to control their weight. But even this snapshot is incomplete, as it only reports the YRBS data to 2005. The 2007 YRBS data, released in the CDC Morbidity and Mortality Weekly Report on June 6, was not included. The latest 2007 YRBS report said that “the prevalence of most risk behaviors does not vary substantially among cities and states.” Arkansas was comparable to the rest of the country in most all of the surveyed behaviors, except for distinct differences in weight control behaviors. ● 16.9% of Arkansas teen girls admitted to going without eating for 24 or more hours to control their weight (compared to 15.8% national average). In addition to the evidence suggesting that teen girls are being most harmed by the Arkansas program, so too have the teens who are heavier than their peers. These young people were nearly four times more likely to be embarrassed by the BMI measurements, 2 ½ times more likely to be dieting and 33% more likely to report feeling concerned about their weight. Yet, their health behaviors were generally “better” than their thinner peers. For example, 89% of the larger teens (≥85th percentile) hadn’t purchased any snacks from vending machine in the past month, compared to 42% of their peers; and 46% hadn’t purchased a beverage, compared to 26% of their peers. The percentage of heavier children who’d consumed soda in the past 24 hours dropped between 2004-2007, but had increased 27% among their thinner peers. This report supports concerns raised for years by childhood development and eating disorder experts that young people are not ready to grasp or appropriately act on even positive nutritional messages. It also sadly bears out the admonitions of the Childhood Obesity Working Group of the U.S. Preventive Services Task Force to professionals and government health officials forging ahead with BMI screening and childhood obesity interventions before they have evidence of being beneficial, that they may put young people at risk of harm. For those who believe that these programs to teach healthy eating and physical activity are urgently necessary, proven to be beneficial and harmless, they are not. Despite their good intentions, this report provides no indication that after four years, the extensive statewide Act 1220 measures have resulted in “healthful” behavioral changes, either. In fact, Arkansas adolescents reportedly eat fewer fruits and vegetables, drinking less milk and more soda than teens across the country. Yet, this report neglected to include any of this information — it’s found in YRBS data. ● 10.5% of Arkansas high schoolers drank 3 or more servings of milk a day, compared to 14.5% national average. ● 39.4% reporting drinking a soda at least once a day, compared to 29.5% national average. The Act 1220 4-year evaluation said that the percentage of Arkansas children reporting that vending machines were available at school dropped by nearly half, with correspondingly fewer purchases. But what kids eat during the school day is not equivalent to their overall diets. Success in reaching policy goals is not support of the soundness of those goals. The Act 1220 evaluation report also revealed a substantial increase in the percentage of Arkansas teens who report they don’t participate in physical education classes in school (from 3% in 2003 to 46% in 2007), a reduction in PE participation (from 71% to 41%), and no change in leisure-time activity during the 4-year evaluation period. Since Act 1220 was enacted in 2003, it has failed to have any measurable effect on children’s weight status; it has failed to demonstrate meaningful improvement in their overall diets or physical activity levels; it has failed to demonstrate improved health outcomes; and there are growing indications that it’s having unintended consequences. Parents, healthcare and educational professionals, as well as taxpayers, might rightfully question if the costs for these school-based initiatives might be better utilized in efforts to help improve the future of Arkansas’ children. Might school days better benefit young people, focused on education, rather than diets and exercise? Math scores among Arkansas 8th grade students, for instance, are below national averages and haven’t demonstrated the increases seen elsewhere in the country. According to the latest 2007 National Center for Education Statistics (NCEP) report, average NCEP math scores for Arkansas 8th grade students showed that only 4% had achieved advanced scores and less than a quarter (21%) even scored proficient – these compare to national rates of 7% and 24% , respectively. Even more concerning, more than one-third (35%) of Arkansas’ 8th graders scored below basic proficiencies. The year four evaluation report concluded by saying that the findings of the continued efforts under this Act and related initiatives to address childhood obesity will help inform decision makers. * Without complete information reaching policy makers on the effects of this Act, however, how likely will they be to make evidence-based policy decisions? And how likely will the vast network of stakeholders be to? The work of the BMI assessments and evaluation reports have been funded for an additional five years by Robert Wood Johnson Foundation. RWJF President and CEO Risa Lavizzo-Mourey, M.D., said in an earlier press release: “There are ‘natural experiments’ taking place... but we can’t afford to surrender an entire generation of kids to the obesity epidemic while we wait for perfect answers.” Parents might not agree that they want their children to be test subjects, but how many even know they are? * The uncritical evaluations of Act 1220, sponsored by RWJF, are being used to support expanded childhood obesity policies and funding for more school-based diet and wellness programs. For instance, they were repeated in the report, Fit Not Fat 2008, recently released by the Arkansas Advocates for Children and Families. ** This paper recommends the state expand the Coordinated School Health Program and community partnerships, support the development of curriculums and products to encourage healthy food choices or increased physical activity, provide for community infrastructure to address childhood obesity, and fund more after-school programs. This organization is a member of the Child Health Advisory Committee, which Act 1220 had given broad authority to guide public health policy and use of children’s health programs, including obesity; to develop the implementation systems, monitor the data and report outcomes. It was the CHAC which developed the school wellness requirements adopted by the AK Dept. of Education and AK Dept. of Health. ** Arkansas Advocates for Children and Families is financed by the Blue Cross Blue Shield “Blue & You Foundation for a Healthier Arkansas” and Arkansas Children’s Hospital. A few weeks ago, a Tucson physician was informed that Blue Cross Blue Shield was terminating his provider contract because he also had a private practice which allowed patients to pay for their care directly. Dr. Steven Knope, M.D., profiled in an Arizona Republic article this past summer, is among a growing number of doctors looking to break free from the assembly-line patient care they say they're forced to adopt under insurance companies, and to return to the era of Marcus Welby. By not tying their practices to insurance companies and by operating as independent businesses — just as doctors have done throughout history — third party payers no longer have control over their practices. No longer can they be manipulated into compliance with insurer mandates on their practices by the fear of loss of income, he said. By managing their own workloads and freeing themselves of the incessant red tape and overhead, paperwork and restrictions of third party payers, they’re able to provide better, more rewarding, quality of care; give patients more of the time and attention they deserve; and provide care less expensively. He believes that more doctors could also be encouraged to provide primary care — more young doctors go into medicine and fewer older doctors leave — because they might find, as he has, that being a doctor and caring for people can be more fulfilling again. Insurance no longer means just coverage for catastrophic medical situations, but has become managed care where both members and providers must comply with insurer directives. Under a third party payer, bureaucrats ultimately determine the care patients receive, not doctors or patients, and doctors must work under its terms and prices. BCBS isn’t the only insurer to terminate the contracts of providers who try to break away and establish independent practices. The response of the insurer backfired, however, said Dr. Knope. It hasn’t had the intended effect of intimidating doctors to “prevent them from escaping the confines of insurance company contracts” and making him an example of those who dare to practice without them, he said. I'm all for free-market medicine and competition...This interchange with BC/BS is an example of how the free-market sorts things out. Blue Cross has every right to refuse to do business with me. Likewise, I can decline to do business with them. I don't need the government to protect me from "big business." I can simply offer a different kind of medical care and allow the public to choose where they want to spend their healthcare dollar. 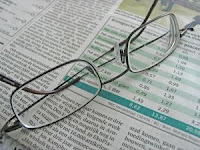 But is it ethical for medical care providers to practice independent of insurer contracts? On his blog, Dr. Knope explored this concern that often surrounds a form of free-market medicine, called concierge medicine, which some accuse of being discriminatory. He raised interesting ideas that are so different from what we hear all of the time, they add perspectives that are valuable to consider as we look at all sides of the healthcare reform debates. The first myth is that “the only ethical way to save our medical system is to create a universal health care system, managed by the government and abandon private medicine,” he wrote. “Nobody is talking about the simple, but important fact, that insurance is not health care.” Everybody talks about the evils of third-party payers, he said, and then wants to create an even more massive third-party payer system, calling it universal coverage, which will only add fuel to the fire. He also talked about some of the misconceptions that have evolved about medicine in general since the days of Marcus Welby, and about the ethics of standard medical care as it’s practiced today. Let’s look at the ethics of standard care medicine as well as concierge medicine. Are we to accept that the modern doc-in-the-box who accepts all insurance plans — the guy who sees 30-40 patients per day, spending 7 to 8 minutes with each — represents the ethical gold standard against which concierge physicians are judged? What is so ethical about this practice? Is it good to see so many patients and offer them so little of your time, just to pay your overhead? What about the fact that such doctors sign contracts with insurance companies, agreeing to ration care to their patients, so that Wall Street investors and CEOs can make obscene profits? Dr. Garrison Bliss in Seattle, [for example] has implemented a form of concierge medicine for all, in which patients get same-day service for between $39 and $69 per month and those who cannot pay anything are asked to do several hours of community service for their health benefit. Is this not better and more affordable healthcare than that provided by Medicare? What is so evil about this free-market option? Some consumers fear that doctors practicing what’s called concierge medicine are only in it for the money and that the poor and middle class will be abandoned. But, according to Dr. Knope, those reactions are based on not understanding how concierge medicine works and how medical care has been traditionally provided. It has a place among the options for Americans, he argues. He rhetorically asks: So, there’s no reason doctors can’t care of patients with multiple medical problems in an eight-minute office visits? I tried doing this for almost a decade. I was chief of medicine at a 400-bed hospital. I accepted Medicare assignment and took every health plan and every HMO contract in the city. I saw 40 patients per day. For those who believe that a doctor can do an excellent job in this model, I simply disagree... Doctors who like practicing medicine like this are welcome to continue doing so. If doctors feel they are benefiting more patients by practicing in a third-party model, have at it. But I disagree that one size fits all. It didn’t work for me. If excellence is your goal, it has been my experience that TIME is a necessary ingredient to achieve excellence; time and attention to detail cost money... If patients want to pay their doctor for more time and attention to invest in their health, there is nothing unethical about this. Similarly, doctors who practice concierge medicine are not “unethical” just because you say so; they simply disagree with you. Supporters of the ballot initiative want to ensure that no health-reform scheme will strip them of their freedom to pay privately for health care. Opponents are concerned that if the initiative passes, it could preclude mandatory socialized health insurance. Why does Arizona need this initiative? Efforts in Arizona and around the country are gaining steam to put complete control over your healthcare in the hands of government bureaucrats and appointed 'experts'. Government control means you will have less freedom to make the health care choices that are best for you and your family. Government control over health care means "healthcare-by-lobbyist", not the health care that you believe is best for you or your family. Two hundred and twenty years ago, some founders questioned the need for the First and Second Amendments, and the rest of the Bill of Rights, to be in the US Constitution... Our rights have been preserved by the First and Second Amendments. The Freedom of Choice in Health Care Act will protect the right to health freedom in the same way. What will your initiative do? 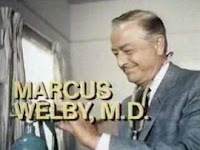 Many of us still hold an image of Dr. Marcus Welby (1969-1976) as the kindly doctor who seemed to have all the time in the world to solve medical ills and who did so with a smile and caring bedside manner, who made housecalls, and never seemed to send a bill. 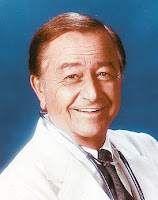 Of course, the television character wasn’t real, but a lot of doctors and patients look back on that era fondly and hope to bring a little of that back into the reality of medicine’s future.